Motorcycle riders may have seen this helmet diagram before in discussions about motorcycle safety. It comes from a safety study by Dr. Dietmar Otte and shows where impacts were recorded on motorcycle helmets during researched crashes. It’s a strong argument for a full-face helmet, with nearly 35% of crashes involving an impact to the chin area. A few years back, gear maker Icon made a one-off of their new Airframe Construct helmet with Dr. Otte’s diagram printed on it. They wanted to highlight how their helmets are built with those impact numbers in mind and have an extra layer of protective material around the chin area. 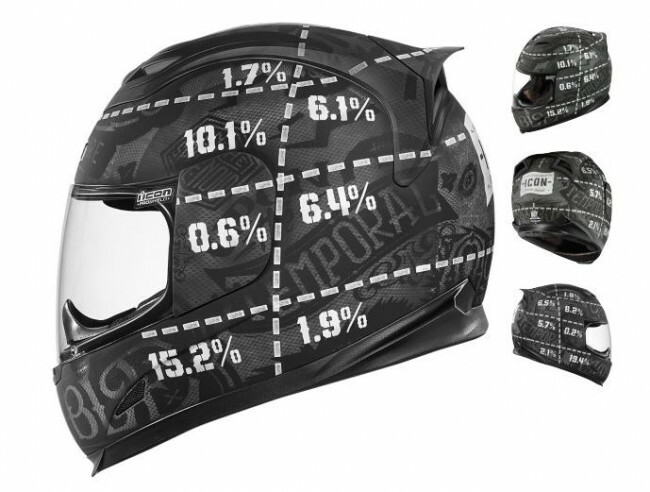 Clearly, the design has been much requested by Icon’s market, because the company will be bringing the Icon 1000 Airframe Statistic Helmet to stores soon.